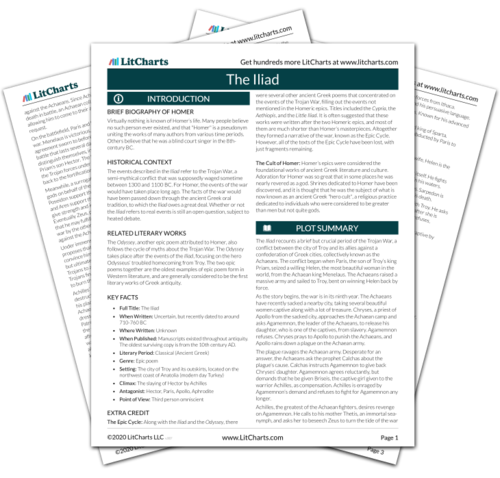 Instant downloads of all 946 LitChart PDFs (including The Iliad). 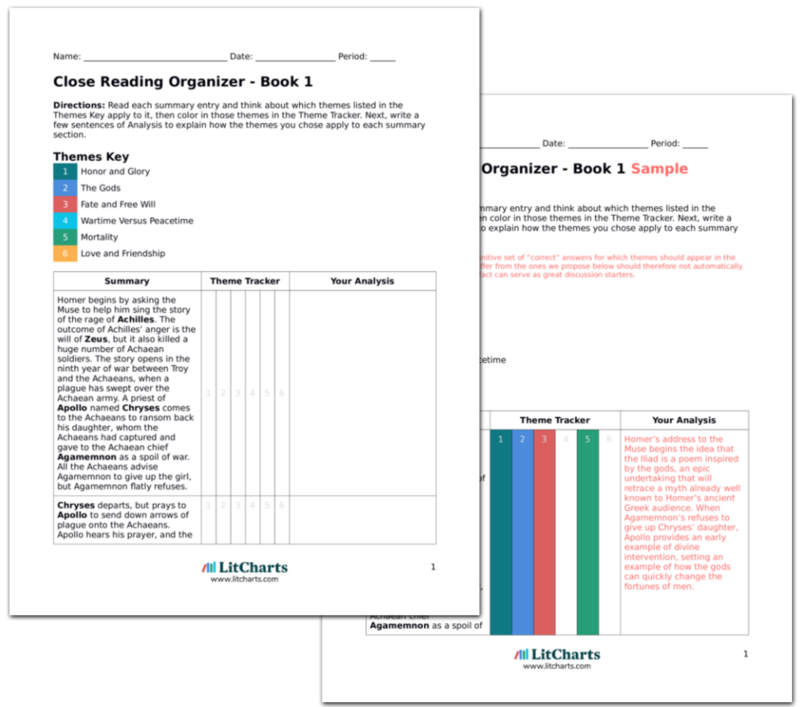 LitCharts assigns a color and icon to each theme in The Iliad, which you can use to track the themes throughout the work. Antilochus races to Achilles’ camp to tell him of Patroclus’ death. Achilles, sitting by ships, realizes the Achaeans are routed and fears the worst. Antilochus arrives and delivers the news. Achilles dissolves into grief, weeping uncontrollably and abasing himself in dirt. Antilochus stays near Achilles, fearing that Achilles will try to slash his own throat. Achilles’ expression of grief is extremely passionate, indicating the very close bond that Achilles shared with Patroclus. With his greatest comrade dead, Achilles nearly loses the will to live, and in throwing himself into the dirt suggests that he now regrets his part—and pride—in allowing Patroclus to die. Achilles lets loose a “terrible, wrenching cry” that his mother Thetis hears. All of the sea nymphs of the ocean gather with Thetis and fly to Achilles. Thetis laments Achilles’ approaching death, saying she can do nothing to prevent it. Thetis asks Achilles the reason for his sorrow, and Achilles tells her of the death of Patroclus. Achilles says he’s lost the will to live other than to kill Hector. Achilles, as the son of a goddess, always has access to his mother’s attention. However, now his grief is so great that all the nymphs of the ocean come to attend Achilles. Achilles’ grief is beginning to form itself into anger as he acknowledges that he must kill Hector. Achilles mourns his previous inaction, and says that he is now ready to accept his fate by revenging himself on the Trojans. Thetis observes that Achilles no longer has any armor of his own, and tells him that she will go to the smith god Hephaestus. She tells Achilles to stay out of battle until the next dawn, when she will return with splendid new arms. The sea nymphs return home as Thetis speeds to Olympus. Hector currently wears Achilles’ armor, a gesture that implies that Hector now claims to be Achilles’ equal in battle. The new god-made armor will become a symbol of Achilles’ complete superiority over all other mortal soldiers. Earlier, Achilles refused to risk his life for mere treasure or for Agamemnon. But now, in getting revenge for Patroculus's death, he has found reason enough to face his fate—great glory and certain death. On the battlefield, the Achaeans continue the retreat of Patroclus’ body. The Aeantes keep defending and Hector keeps pressing them closely. Hector is close to seizing Patroclus’ body. Iris informs Achilles that he must help defend Patroclus. Achilles tells Iris that he has no arms for war. Iris tells Achilles to simply show himself in order to strike fear into the Trojans. Achilles appears on the Achaean rampart, crowned by Athena with a golden cloud. Achilles gives his war cry and the Trojans panic. The Achaeans take the opportunity to finally pull Patroclus’ body to safety. Battle ends for the day. Achilles is so respected as a fighter that his mere presence instills terror into the hearts of his enemies. Athena further enhances his presence with a godlike quality. The fall of night creates a pause after the last 8 books of pure action, building tension for Achilles entry into battle when fighting resumes. 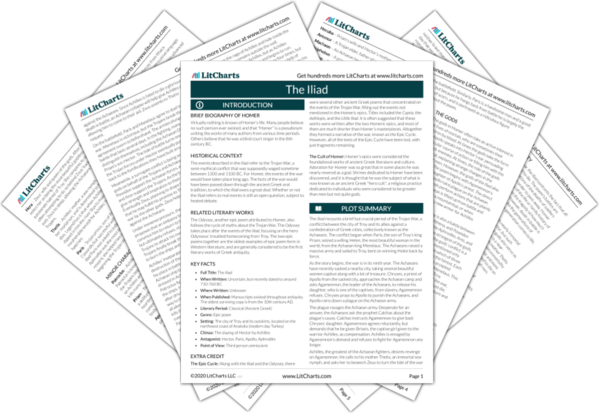 Get the entire The Iliad LitChart as a printable PDF. In the Trojan camp, Polydamas advises the Trojans to withdraw back into Troy’s walls. He states that the Achaeans were difficult enough foes without Achilles, and now he is sure to return. Zues causes Hector to reject Polydamas’ advice, calling it cowardice, and commands the Trojans to camp outside the Trojan walls for another night. The Trojans will attack again in the morning. Polydamas, sensing the tide of battle turning, gives the correct advice, but Zeus’ intervention makes his good sense useless. Now it is Hector, influenced by the gods, who fails to read the signs correctly and whose pride prove fatal. With the Trojans still on the field of battle, Achilles will be able to use his full force, gaining great glory when he returns to battle. At night, the Achaeans mourn Patroclus. Achilles begins to prepare Patroclus’ body for burial, but says he will not bury him until he has slain Hector. Achilles again says he is doomed never to voyage home. Achilles constantly demonstrates his grief for Patroclus, and his decision to keep Patroclus body unburied is his form of respect. Revenge must come first, and Achilles is willing to face certain death to achieve it. The other warriors face likely doom every time they fight. Achilles is different—his love for Patroclus and desire to take revenge upon Hector are so great that he chooses to act despite knowing it will lead to his death. This is truly heroic. On Olympus, Thetis reaches the home of Hephaestus, which houses magnificent forges. Thetis is welcomed into the house, and Hephaestus remembers that Thetis cared for him for nine years after his fall from Olympus. Thetis speaks of her marriage to Achilles’ mortal father, and explains the situation of Achilles’ lack of armor. Hephaestus gladly agrees to make a new set of armor greater than any other owned by a man. The fact that Achilles’ mother is a goddess gives him special privileges that no ordinary mortal could hope to expect, and Thetis is completely dedicated to giving Achilles honor in his short life. Achilles’ new armor will demonstrate his complete dominance in battle. Hephaestus sets to work. He forges the famous shield of Achilles that contains on it a picture of the entire world. It includes the sea, the sky, and the world of men in all its different forms. The shield has two cities of men, one at peace and one at war, and has scenes of marriage, harvest, shepherding, and battle. The depth of detail is staggering. Hephaestus also forges a helmet and breastplate. When his work his finished, he lays the armor at Thetis’ feet. Achilles’ shield is a symbol of the interconnected nature of war and peace in the world of ancient Greece. Battle, just like harvest or marriage, is a staple of any citizen’s life. With the entire world represented on Achilles’ shield, Achilles is singled out as one of the foremost representatives of humanity, unique in his strength. In his shield, he literally carries the world, just as he carries the success of the Achaeans. Wallace, David. "The Iliad Book 18." LitCharts. LitCharts LLC, 17 Sep 2013. Web. 18 Mar 2019. Wallace, David. "The Iliad Book 18." LitCharts LLC, September 17, 2013. Retrieved March 18, 2019. https://www.litcharts.com/lit/the-iliad/book-18.